Citing artistic differences, Al Diaz and Basquiat chose to sever their artistic collaboration, SAMO, with this three-word announcement. Carried out episodically at various cites as a piece of ephemeral graffiti art, the phrase surfaced repeatedly on gritty buildings throughout Lower Manhattan. At one time a sign of trespassing and vandalism, graffiti in the hands of Diaz and Basquiat became a tool of artistic "branding"; repeated here and there throughout the billboard-dotted city, "SAMO is Dead" slowly took on the status of a corporate mantra, such as, for instance, Coca Cola's "It's the Real Thing". An example of Basquiat's early canvas-based work, Untitled (Skull) features a patchwork skull that seems the pictorial equivalent of Mary Shelley's Frankenstein - a sum of incongruent parts. Suspended before a New York City subway map-like background, the skull is at once a contemporary graffitist's riff on a long Western tradition of self portraiture and the "signature piece" of some anonymous, streetwise miscreant. Basquiat's recent past as a gritty curbside peddler, virtually homeless floater, and occasional nightclub interloper are all equally stamped into this troubled three-quarter profile, making for a world-weary icon of the displaced Puerto-Rican and Haitian immigrant Basquiat forever seemed to remain even while successfully navigating the newly gentrified streets that were 1980s SoHo. Like a page pulled cleanly from a daily artist's journal, this untitled canvas features Basquiat's personal iconography, some reminiscent of that of Paul Klee. Boldy appropriating images commonly associated with African art - a skull, a bone, an arrow - Basquiat modernizes them with his Neo-Expressionist style of thickly applied paint, rapidly rendered subjects, and scrawled linear characters, all of which float loosely across the pictorial field, as though hallucinatory. A white skull juts from the center of the ebony composition, vividly recalling a revered painter's tradition of the memento mori - a reminder of the ephemeral nature of all life and the body's eventual, merciless degeneration. Basquiat demonstrates in one concise "study" how he is able to carry on an ancient practice of painting "still life", all the while suggesting, as does a great jazz musician, that the artist's work was relatively effortless, if not completely improvisatory. Flexible features two of Basquiat's most famous motifs: the griot and the venerable crown. A sole black figure, half cadaver, half living entity, stares "blindly" at the viewer, its arms creating a closed circuit, perhaps a reference to spiritualized energy. With few distinguishing characteristics, the subject takes on the visage of the Everyman. 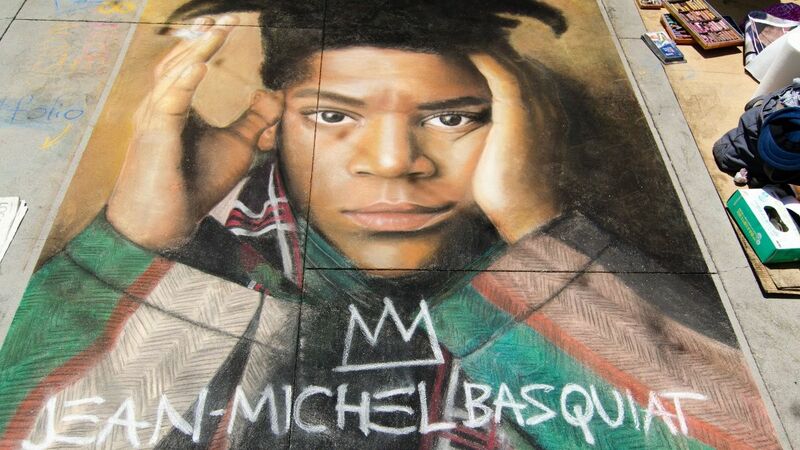 At the same time, this is not just any figure, but one of African ethnicity and proud heritage a clear reference to Basquiat's own identity (note the diagrammatic rendering of the figure's lungs and abdomen, reminiscent of the young Basquiat's fascination for Gray's Anatomy sketches). 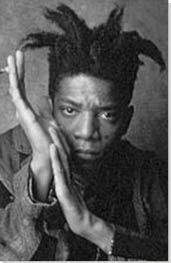 Given that the griot is traditionally a kind of wandering philosopher, street performer, and social commentator all in one, it is probable that Basquiat saw himself in this role within the New York art world, one that nurtured his artistic success but also swiftly exploited it for material profit. As though he were reconstructing an epic history, or precedent, for his own ancestors' arrival on the American continent, this expansive work of the early 1980s compresses together the relationship of Egypt to Africa, with references to more local centers of African-American music and greater southern culture, such as Memphis, Tennessee. At the center of the painting, Basquiat depicts a yellow Egyptian boat being guided down the Nile River by the god Osiris. Rife with visual and textual references to African history, the painting tackles a heady subject with a deceptively naïve style. Basquiat's late-period works feature multi-panel paintings, in the tradition of Renaissance religious tryptichs, and canvases with exposed stretcher bars. Often the surfaces of these pieces are virtually consumed by their own freight of dense writing, collage, and abstruse imagery. Typical of their collaboration, "Arm and Hammer II" demonstrates how Basquiat and Warhol would pass a work between them for their mutual intervention, like a game of chance happening, free association, and mutual inspiration. Warhol's characteristic employment of corporate logos and advertising copy as shorthand signs for the materialistic modern psyche is frequently overlaid by Basquiat's only partially successful attempt to deface them, or otherwise "humanize" them, freehand, as though he were vainly railing his fist at a largely invisible and insidious monster. Ten Punching Bags (Last Supper) is a collaboration between Basquiat and Andy Warhol, once commissioned by Alexandre Iolas, the international art gallerist and collector. This piece was originally intended to be displayed in Milan directly across the street from Leonardo da Vinci's Last Supper. Opposite the Renaissance masterpiece, Ten Punching Bags was to function, somewhat playfully, as a "call to arms" for contemporary art against all forms of ideological oppression.